In 1996, he was a teenager, and North Korea was in the grip of a devastating famine that forced Ji and his siblings to eat grass and rats. Ji was trying to steal a few pieces of coal from a train so he could barter it for food, but he passed out from hunger and was hit by a train. He survived but had to have his left arm and his left leg amputated — without anesthesia — as a result. Life got even tougher for him. But a decade later, he managed to escape, making the journey across the Tumen River into China and eventually all the way down to the south of the country and across into Laos and then Thailand. From there, he was sent to South Korea — and was fitted with a prosthetic arm and leg. Today, he runs a group called Now Action and Unity for Human Rights, helping other North Koreans to escape from the regime. …we are joined by one more witness to the ominous nature of this regime. His name is Mr. Ji Seong-ho. Today he lives in Seoul, where he rescues other defectors, and broadcasts into North Korea what the regime fears the most -- the truth. It was that same yearning for freedom that nearly 250 years ago gave birth to a special place called America. 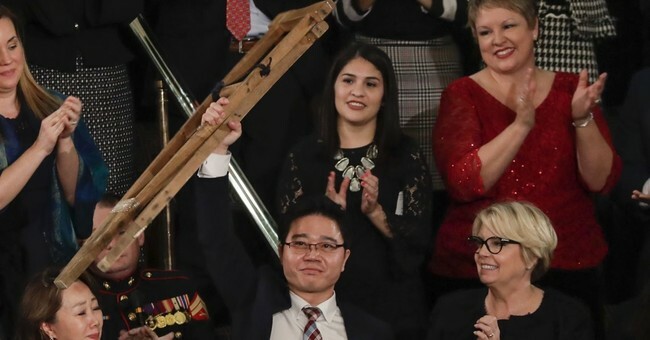 Ji Seong-ho then raised his crutches in defiance of his oppressors. Communism will never win.